With a magnificent moat, cobbled lanes, ancient temples, atmospheric ruins, massage parlours, Thai cooking schools and plenty of noodle stands, Chiang Mai has rapidly gained a substantial share in the Asian tourism market. More and more tourists visit Chiang Mai every year and enjoy its true fusion of different cultures and lifestyles. No trip to Chiang Mai could possibly be complete without experiencing the legendary Night Bazaar, which is the ultimate place to pick up a souvenir of Thailand. Tourists should also consider taking a trip on one of the city's many 'tuk tuks', speedy three-wheelers which are small enough to weave in and out of congested traffic. In total, the Chiang Mai area is home to in excess of 300 historic temples, more than 120 of which are located within the city's municipal limits. Many of the most historic tourist attractions lie within the old city of Chiang Mai, a particularly appealing spot surrounded by both walls and moats, and dating back to the end of the 13th century. For up-to-the-minute tourist information in Chiang Mai, including any forthcoming events, visit the Tourism Authority of Thailand (TAT) on Chiang Mai-Lamphun Road, which was actually the first public branch of this official tourism to open throughout Thailand. The office is easy to find, being especially close to the Saphan Lek Bridge, on the Chiang Mai-Lamphun Road. Chiang Mai is full of tourist appeal and many visitors find that the best way to begin their sightseeing is to take a guided walking tour, or a relaxing cruise along the Mae Ping River. Families in Chiang Mai will always enjoy the various elephant shows and rides, the city's large ice-skating rink and also the many exotic creatures at Chiang Mai Zoo and Arboretum. Those with a taste for excitement will find white-water rafting, balloon rides, rock climbing, trekking, bungee jumping and even microlight plane flights. 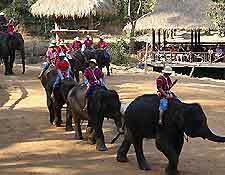 More information about Chiang Mai Tourist Attractions. The most interesting and impressive landmarks around the city of Chiang Mai are those with a little history. Look out for the Tha Pae Gate, one of the remaining city gateways, and also the innumerable shrines and temples, the most significant of which includes the Wat Chedi Luang, Wat Ku Tao, Wat Phra Singh, Wat Phrathat Doi Suthep, Wat Suan Dok, and also the Wat Chiang Man, the oldest temple in the whole of Chiang Mai, dating back to 1296. More information about Chiang Mai Landmarks. For a spot of culture in Chiang Mai, tourists should consider visiting one or more of the city's many museums. For in-depth information about the fascinating Lanna culture, the National Museum is worth a look, while for children, the sea shells and fossils at the Museum of World Insects and Natural Wonders will undoubtedly be a big hit. Art lovers should set aside time to enjoy the exhibits at both the Chiang Mai Arts and Cultural Centre and also the Chiang Mai Faculty of Arts Museum, which is actually part of the city's large university campus. 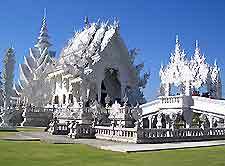 More information about Chiang Mai Museums and Chiang Mai Art Galleries. Located in a particularly scenic part of Thailand, surrounded by mountains, valleys and meandering rivers, the Chiang Mai Province actually contains more areas of natural forest than any other located in this northerly region. 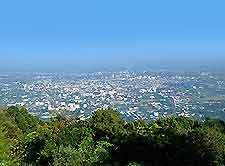 Particularly popular and close to Chiang Mai, the mountain peak of Doi Suthep offers breathtaking views, a temple and the Phra Tamnak Phu Winter Palace. To the east, Bo Sang is better known as the Umbrella Village due to its many paper parasols and hand-painted umbrellas. For Thai silk weaving at its best, the shops within San Kamphaeng are a great place to pick up a traditional souvenir. 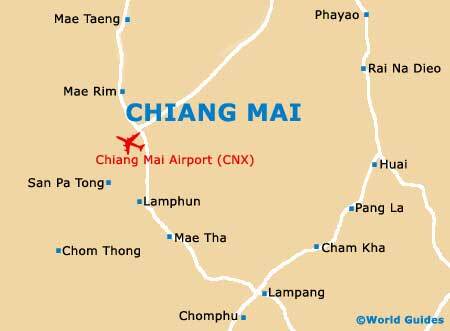 More information about Chiang Mai Attractions Nearby.